This week’s BEACON Researchers at Work blog post is by University of Idaho graduate student Tyler Hether. Evolutionary biology has historically approached the genetics of adaptation from two perspectives. From the genetic perspective, focus has been given to population dynamics and functional roles of single genes. From the phenotypic (trait) perspective, quantitative genetics has provided us with a theoretical base and empirical framework to study adaptation of suites of traits simultaneously. At the interface between these two lie interaction networks among genes that affect phenotype—the genotype to phenotype map—and it is the incorporation of a network-level functional view of genetic interactions into models of multivariate phenotypic evolution that represents a new synthesis in biology. An initial step toward this synthesis is to explore the consequences of simple network motifs on patterns of pleiotropy and epistasis. Imagine a situation where many genes up and down regulate one another. If a mutation were to occur in one of these genes what effect would that mutation have on the entire network? Could the network structure facilitate or impede adaptation? Recently, Paul Hohenlohe and I set out to identify how network structure can affect multivariate adaptation. Generally, the amount and rate of adaptation is proportional to the amount of existing additive genetic variation in a population. In other words, with more additive genetic variation a population can respond quicker to selection than with less of this variation. When talking about two or more traits we have a matrix of variation and covariation instead of a single metric—the G-matrix—and the structure of this G-matrix is used to predict phenotypic trajectories while populations adapt. The G-matrix is useful in the context of adaptation because it reveals the amount of genetic variation and covariation that can respond to selection. For more detail overview of how the G-matrix can affect adaptation see this useful website. Critical to the G-matrix is new phenotypic variation and covariation that is brought about by new mutations. This phenotypic variation and covariance that arises from new mutation is the “mutational effects” matrix, M-matrix. So how can network structure affect multivariate adaptation? One of our hypotheses was that mutations that arise in gene networks create predictable levels pleiotropy and epistasis that can affect the rate of adaptation. To test this we looked at six different two gene-two phenotype models that range from each gene regulating itself to both genes regulating the other in a feedback loop. The regulation was modeled using Michaelis-Menten-like dynamics and the phenotypes we were interested in were the rate of gene expression at equilibrium for each gene (see Figure 1A and D, below). Depending on the network structure a mutation that occurs in one gene could have a cascading effect across the network, affecting the expression of both genes and, hence, change both phenotypes. Figure 1: Pleiotropy and functional epistasis in gene regulatory networks directly affects rates and trajectories of adaptation. For comparison we show two types of interactions: top row (A-C) shows a negative interaction where the upstream blue gene down regulates the downstream red gene; bottom row (D-F) shows a negative feed-back loop between blue and red genes. Panels A & D) The resulting map from genotype to phenotype (equilibrium expression rates) highlights differences between these two models as a result of gene interactions (blue and red lines show phenotypic values for trait x1 and x2, respectively). Panels B & D) M-matrices across phenotypic space shown as ellipses (scaled 2.5X). At the genotypic level, mutations are random with no covariance between traits; however, mutation at the phenotypic level depends on the network model and the location of individuals in trait space. 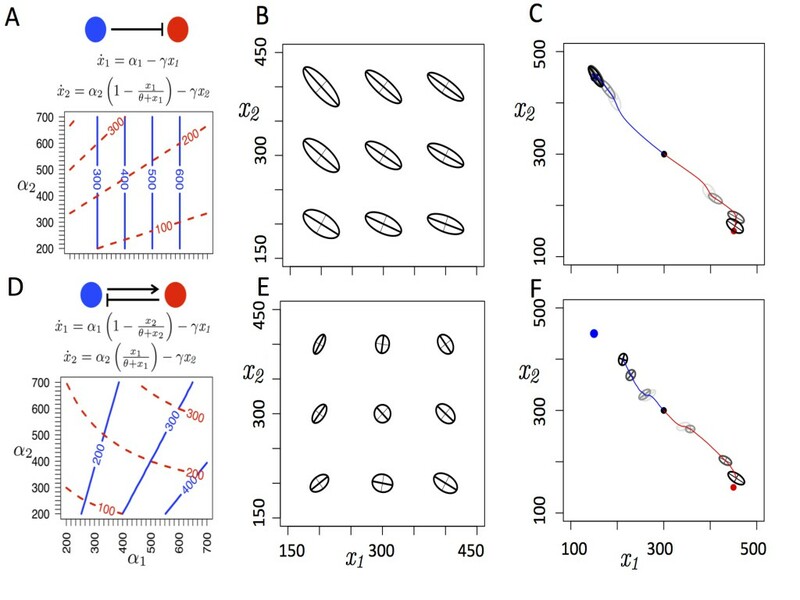 Panels C & F) This variation in M-matrices affects the shape of the G-matrix (ellipses) and adaptation towards new phenotypic optima (blue and red lines track phenotypic means of populations evolving towards blue and red dots, respectively). Parameters: migration rate = 0.001, selection strength = 10000, mutation rate = 0.01, population size = 2000. For example, Figure 1A shows the genotype to phenotype map for two networks. Blue and red lines show the phenotypic values for the blue and red genes, respectively. Had these genes been independent from one another the blue lines would be perfectly perpendicular to the red lines since each gene only would affect the expression of itself. In the top row the blue gene suppresses the expression of the red gene and, as a result, the contour lines are not perpendicular. In this particular network, if a mutation were to occur that increased the allelic value of the blue gene it would simultaneously increase the blue phenotype while decreasing the red phenotype. We can see this mutational effect in the M-matrices (Figure 1B). Here we show M-matrices graphically using ellipses across 9 points in phenotypic space. Figure 1B highlights the first of two interesting results. That is, there is a negative covariance in the M-matrix (the major axis of variation resembles your computer’s backslash key). The bottom row of Figure 1 (D-F) shows a more complex network, a negative feedback loop. Though still apparent in the previous example this negative feedback loop highlights the second interesting result we found. That is, the shape and orientation of the major axis of mutation (co)variation changes: it depends on where individuals reside in phenotypic space (Figure 1E). For example, if the population was comprised of individuals on the bottom right corner of Figure 1E they would have negative mutational correlation (similar to the previous example) but if the population was comprised of individuals at the top left corner of the plot their mutations would show a positive mutational correlation. even though the red population traveled about 47% farther than the blue population in phenotypic space (Figure 1F). Figure 2: Single simulation run for the negative feedback loop drawn in “mutational space”. In phenotypic space each polygon would be a square with equal area. 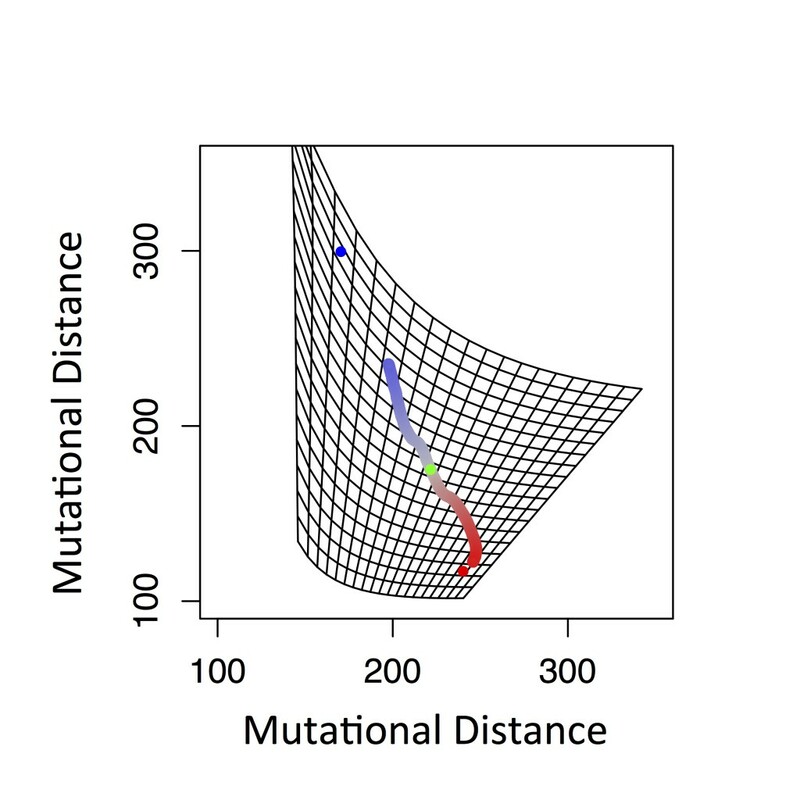 Note that the blue and red dots are equidistant from the starting point in phenotypic space (Figure 1F) but the blue dot appears farther than the red in this rescaled mutational landscape. This research underscores how simple gene interactions can create complex genotype to phenotype maps and the wiring of such networks can influence the speed at which populations can respond to selection. Though the networks considered here are relatively simple they could be thought of has two genes on opposite ends of a larger yet well connected network. We are currently interested in expanding beyond two genes, allowing individual networks to evolve, and looking for evidence of “evolving M-matrices” in empirical systems. For more information about Tyler’s work, you can contact him at tyler dot hether at gmail dot com.